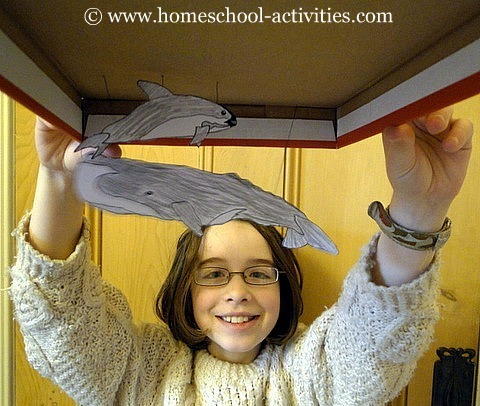 Make an ocean diorama from a shoe box with our free kids Action Pack. 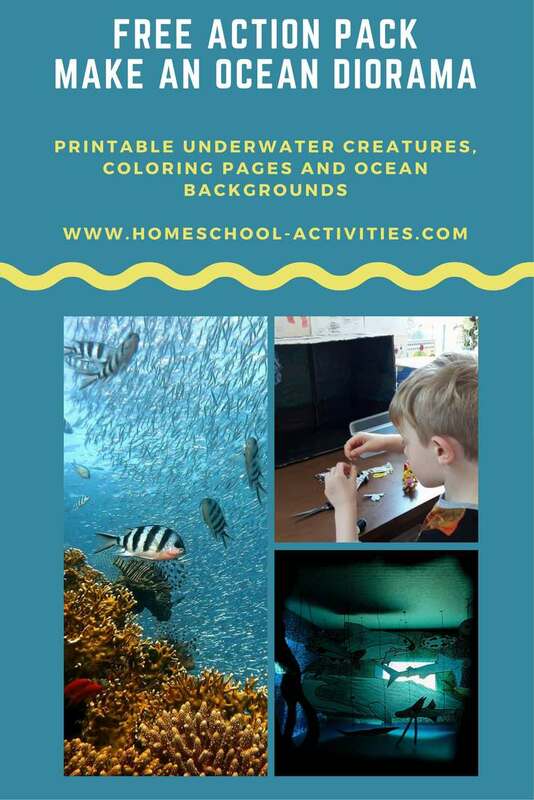 You can print out coloring pages of ocean creatures and underwater backgrounds to help you make a fabulous diorama. 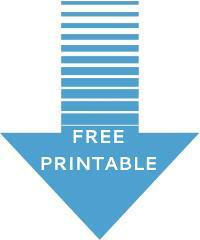 Underwater scenes which you can print out and stick on the sides of your ocean diorama. Coloring pages of ocean creatures including everyone's favorite whale and dolphin. 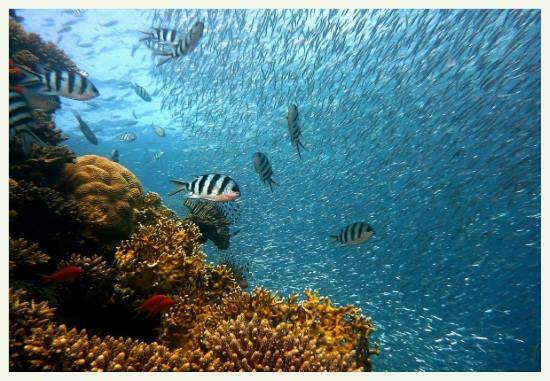 Beautiful photos of ocean creatures which you can use to decorate the outside of your diorama or hang from the inside. This diorama is a wonderful crafts project which is easy and fun if a little fiddly! "Thank you for these beautiful ideas and pictures. It's the first time as a preschool teacher that I have made an Ocean Diorama, so I'm nervous. 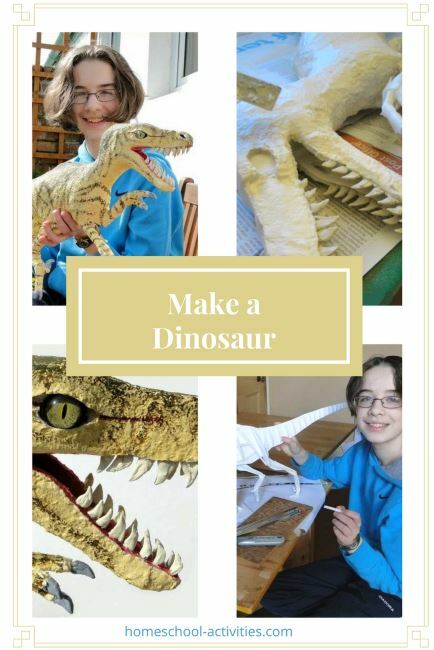 This is a crafts project which is best for early high school age though younger kids will love it - you just need to be around to help. We loved the way adding a secret peephole in the back of the box gave you the feeling that you were entering a real undersea world. whatever subject fascinates your kids! The undersea scenes in the Action Pack for the ocean sides and floor or you can use blue card stock. Blue iridescent paper works well for the sides of the ocean. 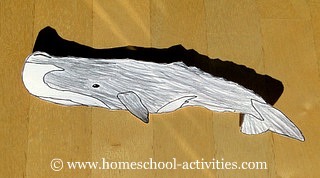 Homeschool crafts paper and pens for drawing your ocean creatures. Print out and color in the ocean creatures in the Action Pack. Have a look at the bottom of the page to see how Steph's family have cut away the side of a box to create a fabulous diorama. Download our free Ocean Diorama Action Pack here. 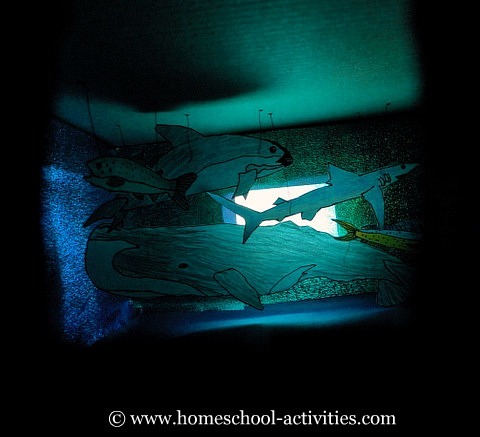 You'll have fun with your kids making this homeschool ocean diorama in a box. In case you're wondering, 'diorama' just means a miniature scene. Take the lid off your shoe box. Line the inside bottom with the underwater scenes or blue card stock and stick down with glue. Cut a square peephole 2.5cm x 2.5cm (1in. x 1in.) 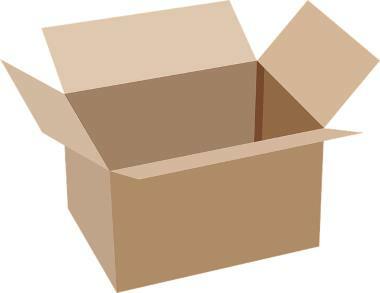 in the end of your box. This is the fun bit! At the other end, you'll need to cut a larger hole 7.5cm x 5cm (3in. x 2in.) which will let the light in. Tape or glue a piece of blue colored tissue paper 10cm x 7.5cm (4in. x 3in.) over the larger hole. This is where you'll use a lamp to shine light through to reveal the wonders of your homeschool ocean world. Finally, line the sides of your box with underwater scenes or blue iridescent paper and glue it down. Our homeschooling ocean diorama crafts project was great for letting William have a go at practical homeschool Math skills like measuring. 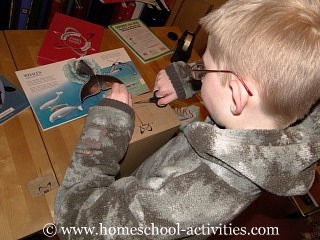 You can see him having fun cutting holes in our homeschool shoe box! Now's the time for trying out some free homeschooling art skills as you draw all the creatures who are actually going to live in your ocean diorama. 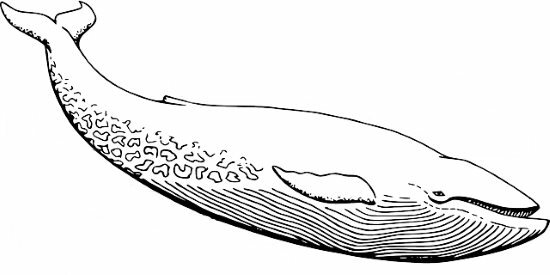 This lovely blue whale is just one of the Ocean Creatures you'll find in the Action Pack just waiting to be colored in! There are also some brilliant books on how to draw sea creatures which will really help. My children loved the How To Draw series; you can see tips on how to draw animals and a wonderful drawing game in our art page. If you want to enjoy homeschooling fun crafts for kids with younger children, I suggest you get them to start here with making fun fish pictures and prepare the shoe box yourself. You could even dangle plastic sea creatures from the lid! 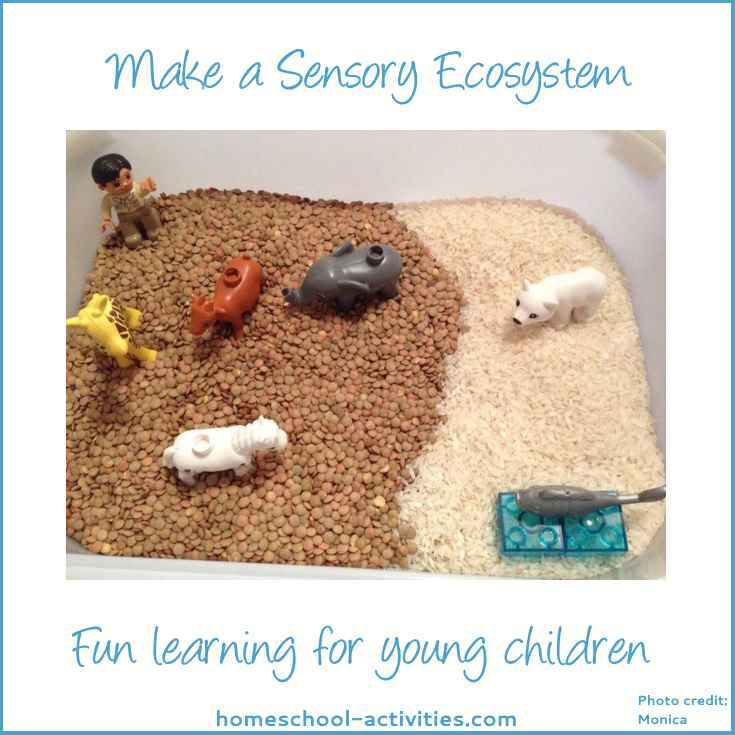 With younger kids, it would also be a great idea to add in suggestions from our free homeschool unit studies Ocean Creatures project creating an ocean scene with real seashells and fingerprints for wave crests. 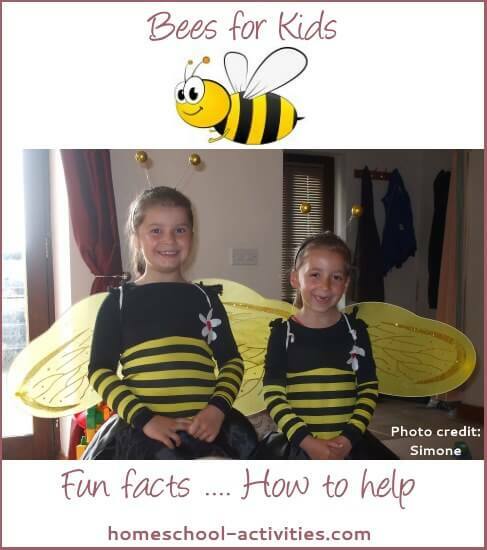 If you have a look you'll see there are lots of free and fun crafts you can do with kids aged 5-7, including trying a homeschooling science experiment in the bath and watching a free live web cam from Monterey Bay Aquarium. You can choose any sea creatures you want - just remember they've got to be the right size to dangle from the homeschool shoebox lid without disappearing through the sea floor! I have to say we haven't been too scientifically accurate in our choice of ocean creatures! You'll see bottom-living tripod fish co-existing quite happily with their surface, saltwater and freshwater chums. 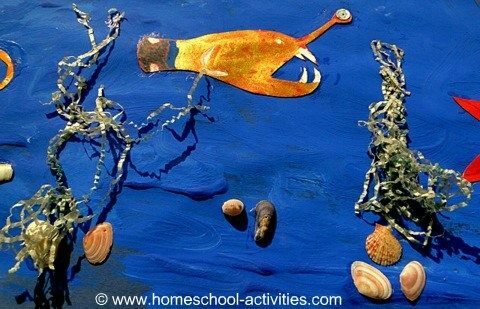 In fact, our homeschooling ocean diorama is a happy jumble of ocean creatures but who cares? Think how many interesting facts your kids will learn about underwater life as they choose the ocean creatures they want to draw. You can spark your kids imagination by looking at ARKive: Fish which has great free images of the TOP 50 endangered fish, including fascinating species like the great white shark, anglerfish and pygmy seahorse. And how about comparing your diorama with the real thing by going on a field trip to your local aquarium? 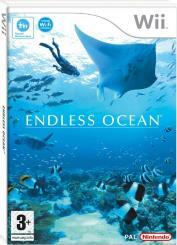 Janet from my Courageous Homeschooling Facebook group has suggested a lovely game you can play exploring the oceans. There are two versions, one for slightly older children and one for younger ones. 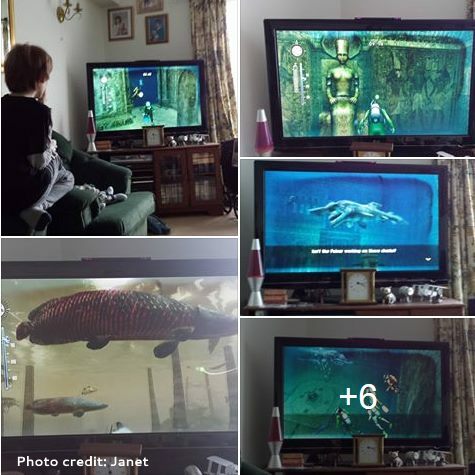 "I took these photos of my son playing Endless Ocean 2 on his time off the other week and thought you might like to see them, I think it's a wonderful, realistic and detailed game....It's very educational as the animals are shown in great detail in their natural environments and there are descriptions of each species, from whales and herring to goblin sharks, giant squid and angler fish. There is a cast of characters, a story line and boats to dive from into some of the world's oceans and rivers." 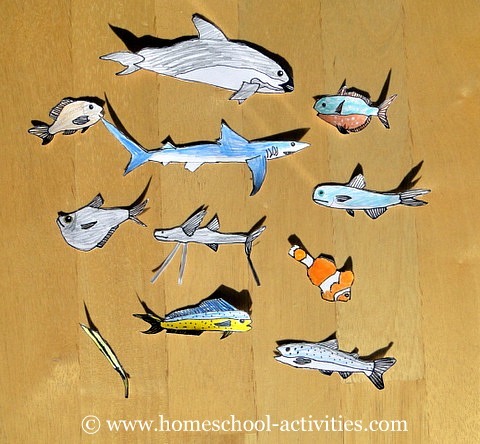 There are lots of ways to practice fun crafts in this free homeschooling ocean diorama! See how we've used homeschool orange acetate to make this jellyfish? 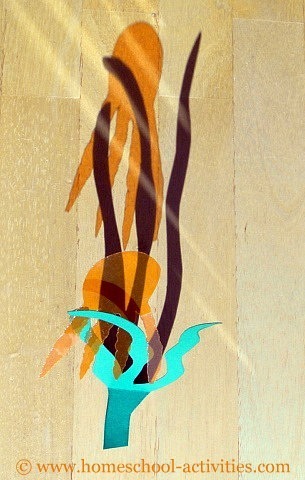 Acetate is great for letting the light through and adding a different 'feel' to your ocean creatures. Free weed is fun to make if you cut it out of some homeschool green card stock and stick it onto the sea floor. 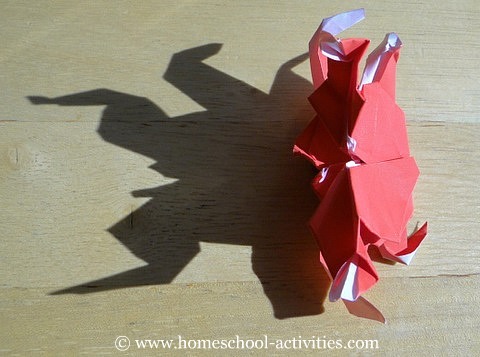 William loves homeschool origami. There are lots of free crafts for kids' books which show you how to make ocean creatures. This crab came from one of them and adds a 3-D aspect to our free homeschooling diorama. Catherine is showing you how to attach your ocean creatures. 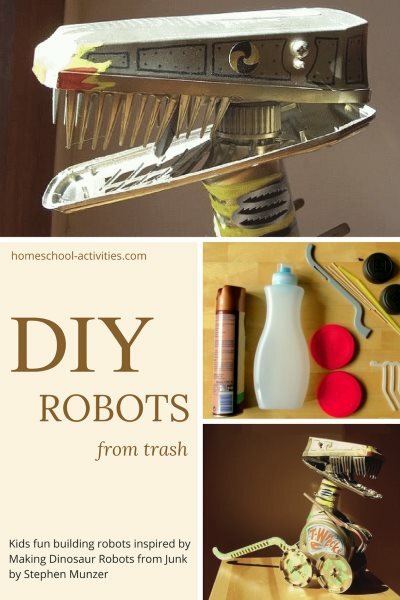 This is the fiddly bit of your homeschooling fun crafts. You need to thread a needle with yarn. Tape one end onto your sea creature and take the other through the lid of your shoe box where he's going to hang. We found most homeschool sea creatures needed to be suspended by two pieces of yarn at the front and the back to keep them level. Tape down the yarn which you've pulled through onto the top of your shoe box lid. Shine the light through the back of your homeschooling diorama, look through the peephole and get drawn into your own free undersea world. What a fantastic way to learn so much and create something so amazing. Well done all of you.